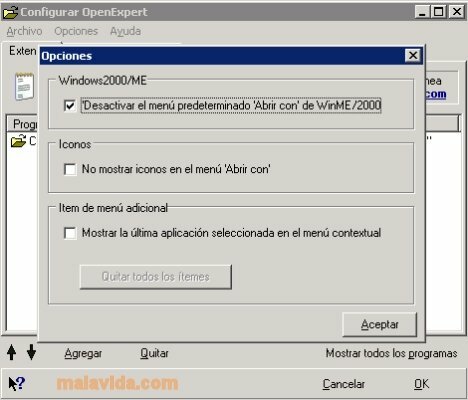 In the Windows operating system each file with a known extension is associated, by default, to an application. This is very useful in the majority of occasions, but we sometimes want to choose what program we want to open a file with. When it comes to launching a file we can choose which application to do it with from the "Open with" option of the Windows Explorer context menu, or better still: using OpenExpert. OpenExpert is a practical application that substitutes the "Open with" tool from the contextual menu, by replacing it with a more powerful, versatile and accessible utility. Thus, you will be able to add all the applications that you want to associate to an extension and even configure the launching parameters. The application allows us to totally customize this interesting menu by adding all our favorite applications and even different versions of the same program. So that when we want to open a file, it is a lot easier to choose the application that we want to use, without having to search for the executable file in the system's folders. This application is free for personal use. It only works with Windows XP or earlier systems.